As time permits, I will be showing my various creations available for purchase. You are most welcome to contact me for payment and delivery options. Commissions are also accepted – please contact me about that, too! To make a purchase please call or email me (gradually adding items to PayPal). 2016, JAD Press, 26 pages of a ‘workshop in a book’, 15 color photos of authentic bogolanfini and the author’s own work, classroom lesson plan chapter, resources and more, all in a horizontal soft clamshell binding for ease of use. Hardcopy is $25.00 plus $5.00 shipping in USA only ( for all other countries, please contact me with your address and shipping will be determined). Electronic pdf file available. Please allow up to 5 days for your copy to be processed. Click here for email contact with the author if you have any questions or use the form below or on the contact page. 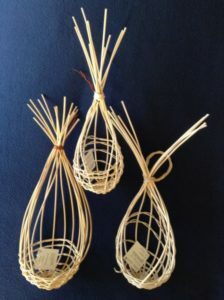 Multi-use sewn cloth mats, miscellaneous fibers (mostly cottons), approximately 5″ diameter. $10 each. 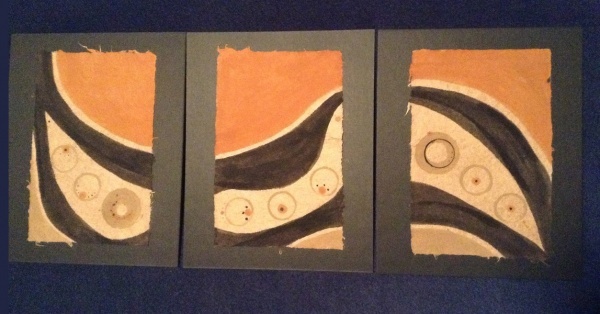 Buried: triptych, handmade paper painted with MUDs and matted (10″ X 8″); $45 each, $80/two, $115/three. Circles: triptych, handmade paper painted with MUDs and matted (10″ X 8″); $45 each, $80/two, $115/three.